The Fuller Center of Northwest Louisiana dedicated homes 41 and 42 Saturday, following week one of The Fuller Center’s two-week 5th Anniversary Build. The two homeowners, Yolanda Braziel and Delisa Robinson, stood with their families between their new homes even as rain started started to fall. "Before, we didn’t have a house decent enough to invite anybody in, but it’s raining and if y’all want to go to my house, come on in!" Braziel of house 42 said, waving the crowd toward what will be her new home. Click here for a VIDEO of Braziel on Dedication Day–and others from throughout the week. Many people came out to take part in the dedication and celebrate with the homeowners and The Fuller Center. 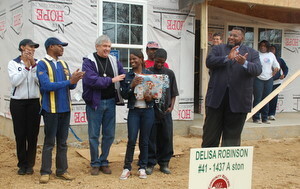 Fuller Center President David Snell and co-founder Linda Fuller presented the homeowners with Bibles and quilts. They had the help of Mack McCarter, founder of Community Renewal International, a nonprofit partner of The Fuller Center in Allendale who sponsored one of the new homes. Mayor of Shreveport Cedric Glover also stopped by to say a few words. "These two homes are important because they are helping us to recapture the heart of Shreveport, the core of this community," Glover said. "Because you cannot have a city if all you have are expensive homes on the outside and a deteriorating core in the middle." Five years ago, The Fuller Center kicked off its building in Shreveport’s Allendale neighborhood after McCarter invited founder Millard Fuller to Allendale to help build homes for Hurricane Katrina evacuees. They’ve since built 40 homes. "Allendale is where The Fuller Center was born. This is where it was nurtured. And today, this is where it is flowering," Snell said. When the build kicked off on March 15, only the foundations of homes 41 and 42 were visible. But thanks to the help of volunteers from Idaho, Texas, Minnesota, Georgia and Shreveport under the direction of site manager Peter Moncrief, the homes were ready for electric work and shingling–and a whole new set of volunteers to show up from across the country. Homeowner Robinson stepped up to speak briefly, just before the rain really started to fall on Shreveport. "I just want to say thank you all, I appreciate you all from the bottom of my heart," she said. Two other covenant partner locations in Louisiana are taking part in the celebration build. The Fuller Center of Webster Parish will hold dedications this week for two completed homes: Springhill on Wednesday and Minden on Friday. And in Belle Chasse (just outside of New Orleans) a home is going up for Katrina evacuee Delores Black to be dedicated Thursday. Click here for the dedication schedule. For links to vides, photos and more from last week’s progress at the 5th Anniversary Build click here.